اشتاقت لحُضن الوطن،،، فحضَنَت أبناء المخيم ! أمه الأرض، وأن ابعدته نكبتين..
روت بعبير نهديها، صباح الخير يا زعتر ! ورممت في جدار القلب اصدآءهم..
بعد أن اتعبها النسيم.. ! وفي عتم ليلها الكحلي.. أغتصبوا ازقتها ..! ولم يرف جفنها.. حين سمعت وقع اقدام الغزاة..! من يملك الحب .. وحيداً أبداً لا يرتحل..! can’t you find a minute for me…. IF YOU CARE FOR PALESTINE YOU WILL READ THIS AND TRY TO HELP, INSHALLAH!! THIS IS MAHMOUD SARSAK! PLEASE PLEASE EVERYONE HELP HIM! 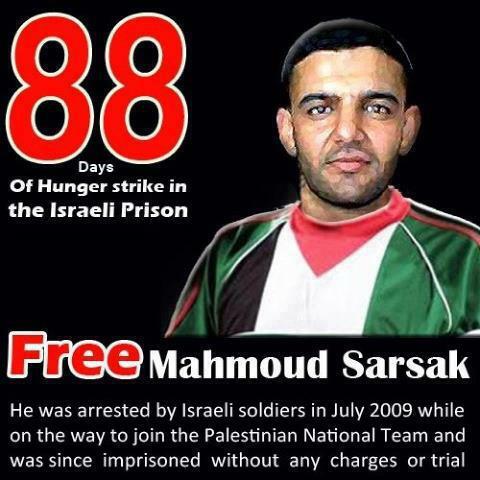 HE IS ON A HUNGER STRIKE AND HAS REACHED A LITTLE OVER 80 DAYS!!! 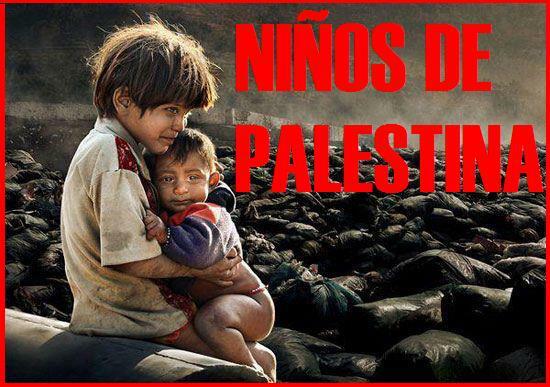 HE AND MANY OTHER PALESTINIANS NEED OUR HELP!! Send this email to as many organisations, football clubs, etc, etc, as you can please? It really can help save someones life. If only the world knew what atrocities Israel commits, then we can unite against them and call for justice, but they need to know first! 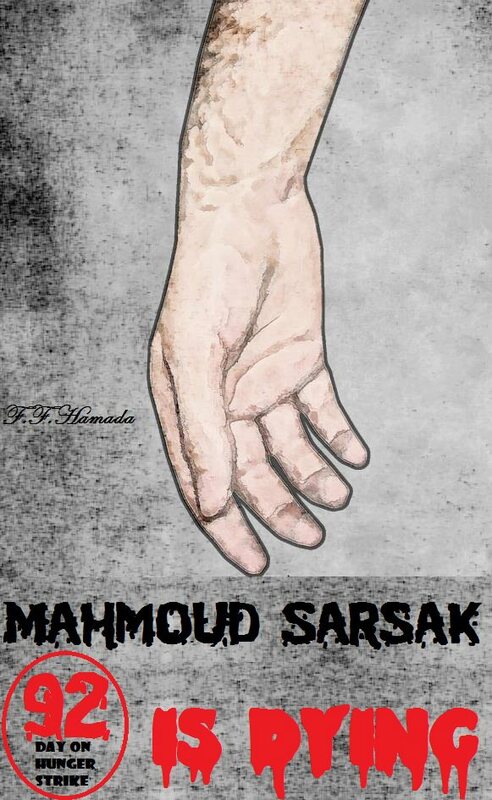 I’m writing on the behalf of thousands of people who wish to see the swift release of Mahmoud Sarsak. Mahmoud is a 24 year old football player, a member of the Palestinian national team, who is currently on hunger strike while imprisoned in Israel. Mahmoud was imprisoned 22 July 2009 while travelling back to his home in the West Bank, accused of being an unlawful combatant, despite a severe lack of evidence. Still he awaits trial. Today (12/06/2012) marks Mahmoud’s 85th day of hunger strike, which has left him extremely malnourished to the point of near-death. Mahmoud is demonstrating for basic human rights, his main goal is to end “administrative detention:” a process by which a prisoner can be detained indefinitely without charge by subsequent renewals of time allotted for administration. Mahmoud’s administrative detention has been renewed six times, with no means of appeal or no hope of a foreseeable trial. We are calling upon you to draw attention to one of the most significant hunger strikers in history. The silence of the press is deafening, and without awareness Mahmoud will pass unjustly while campaigning for justice. We are asking you to raise awareness of Mahmoud’s case and many like him. It is vital that we act quickly, for an independent doctor has confirmed that Mahmoud is on the verge of death, slipping in and out of consciousness. Suppression of fairness is a dark cloud cast over us all; please help us stop this injustice. PLEASE PLEASE WE URGE YOU TO HELP MAHMOUD SARSAK AND MANY LIKE HIM!!!!!! EMAIL AS MANY AS YOU CAN! LET THEM KNOW ABOUT THIS INJUSTICE!!!!! FOR PALESTINE!